Emerging sprinter Shamexpress will take on Black Caviar in the Black Caviar Lightning Stakes at Flemington next month, but Danny O’Brien is under no illusion. O’Brien said he hoped Shamexpress, effortless first up winner at Moonee Valley last Friday night, can run second behind the world champion. “Obviously, we are going around for second, but it just fits perfectly for the Newmarket Handicap,” O’Brien said. “The Newmarket is a race he can win, he’ll have 50 kilos there. O’Brien described Shamexpresses victory as a “barrier trial”. “He’s just a big beast of a three-year-old and he can gallop,” O’Brien said. 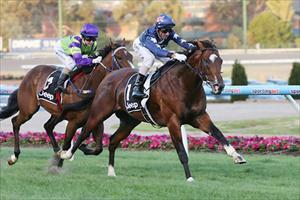 In the Spring, the O'Reilly colt ran third in the Group 1 Coolmore stakes down the Flemington straight. Adamantium, winner of the Standish Handicap earlier in the month, will also a Newmarket Handicap contender, but he may go to the Group 1 via the Oakleigh Plate. A far more conservative approach will be taken with stablemate Decircles, which debuted yesterday with a fast-finishing second behind Rescue Mission in the BMW Handicap. While Decircles raced virtually exclusively in Group company last autumn, where he was second in the CS Hayes behind That’s The One, O’Brien said the bar would not be sent as high this preparation. “He was just rusty, I think. He has been away from the track for so long and there was always going to be tempo in the race, and he was still in holiday mode,” O’Brien said. “We’re going to take baby steps with him. He’s a four-year-old gelding now, we’ve got him hopefully for another three to four years.